They’re the most talked about twosome in the universe. 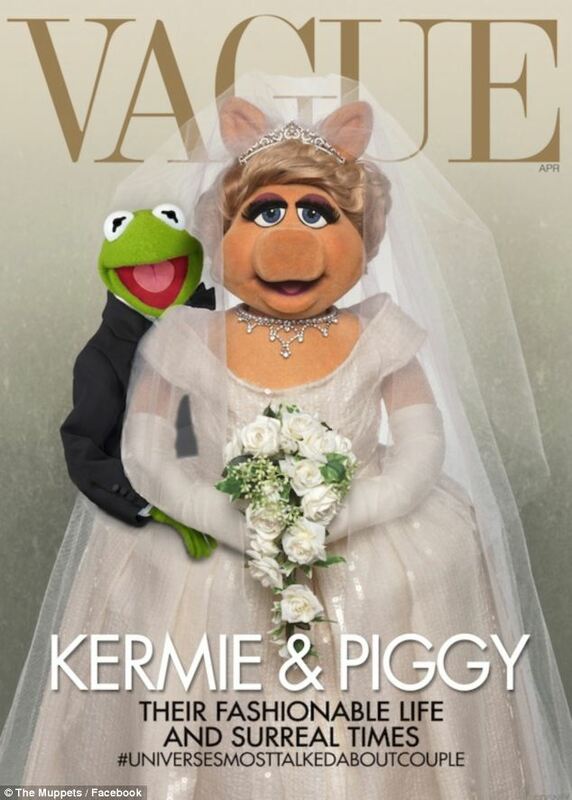 At least, that’s what ‘Vague’ magazine has claimed, as the hottest couple of the moment Kermit and Miss Piggy AKA Kermiggy grace the cover of the prestigious fashion bible’s April issue. Flaunting her curves in a sequined white wedding dress, Piggy looked radiant in diamonds as her handsome beau rested his chin on her shoulder, gazing lovingly ahead… or so it would have read, had the snap not been a spoof of Kim Kardashian and Kanye West’s American Vogue cover, which was revealed on Friday. 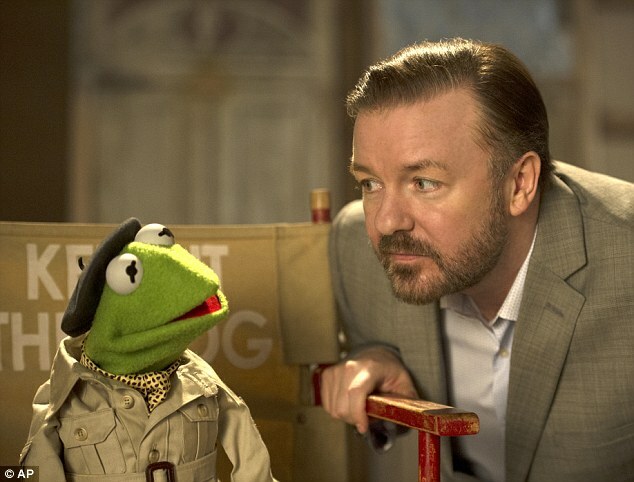 Celebrating the debut of The Muppets: Most Wanted movie, which hit cinemas the same day, the mocked-up image was posted on the furry puppets’ Facebook and Twitter pages. However, Vague took it one step further, elevating the cute couple to #universesmosttalkedaboutcouple, when Vogue merely heralded Kim and Kanye as #worldsmosttalkedaboutcouple. But they weren’t the only ones to poke fun at the much commented-upon cover. Actor James Franco, 35, got creative with Photoshop and revealed his very own cover – featuring himself in the role of Kanye and good pal Seth Rogen as his bride-to-be. 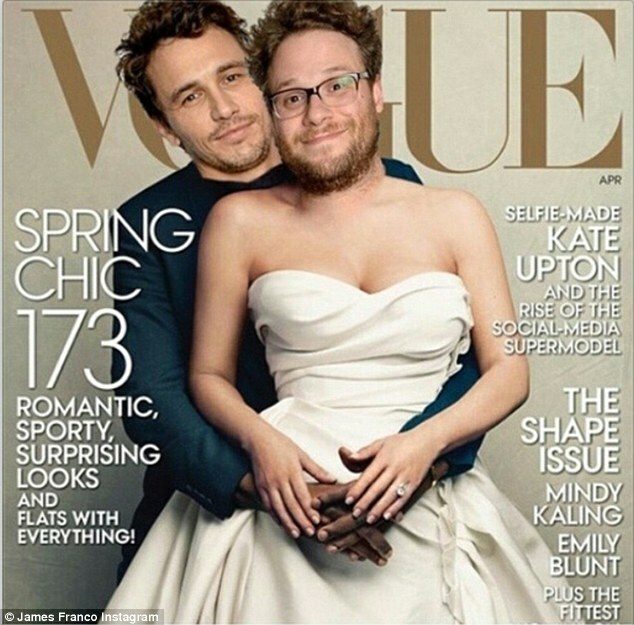 However, instead of posing together for the shot, Franco had merely pasted their faces over the famous couple, with bearded Rogen taking over Kim’s voluptuous body. The This Is The End co-stars have previously mocked the high-profile pair’s artistic contributions, creating their very own version of Kim and Kanye’s cringe-inducing video Bound 2. In it, an under-dressed Seth sat backwards on a motorbike as he kissed James, who was decked out in a tie-dyed T-shirt. Both Vogue spoofs proved instant hits with fans, who deemed them a great improvement on the original. 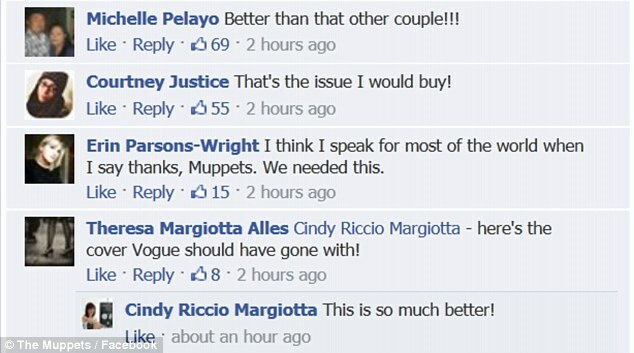 Franco’s Instagram received over 48,000 likes in twenty minutes, while Muppets fans took to social media to air their approval. ‘I think I speak for most of the world when I say thanks, Muppets. We needed this,’ fan Erin Parsons-Wright added. 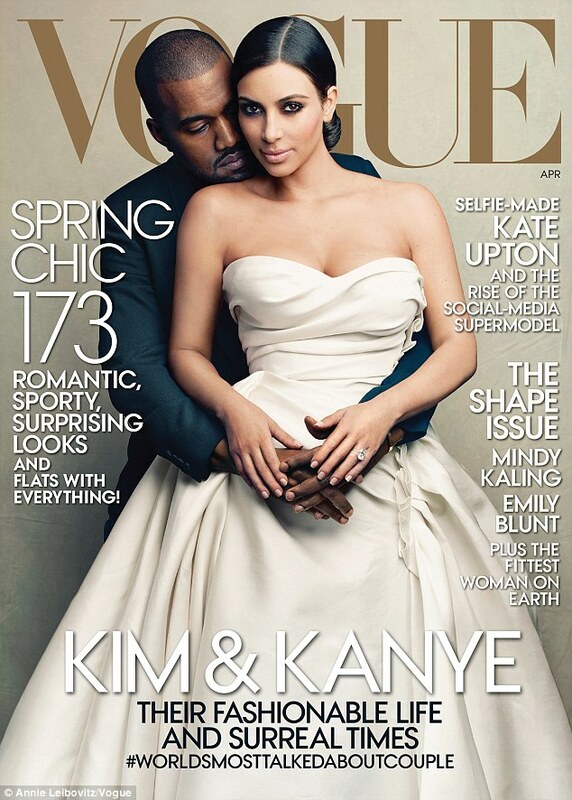 Unfortunately for Kimye, their cover wasn’t nearly as well received. ‘KIM KARDASHIAN and VOGUE shouldn’t be put in the same sentence. End of.’ one reader raged. 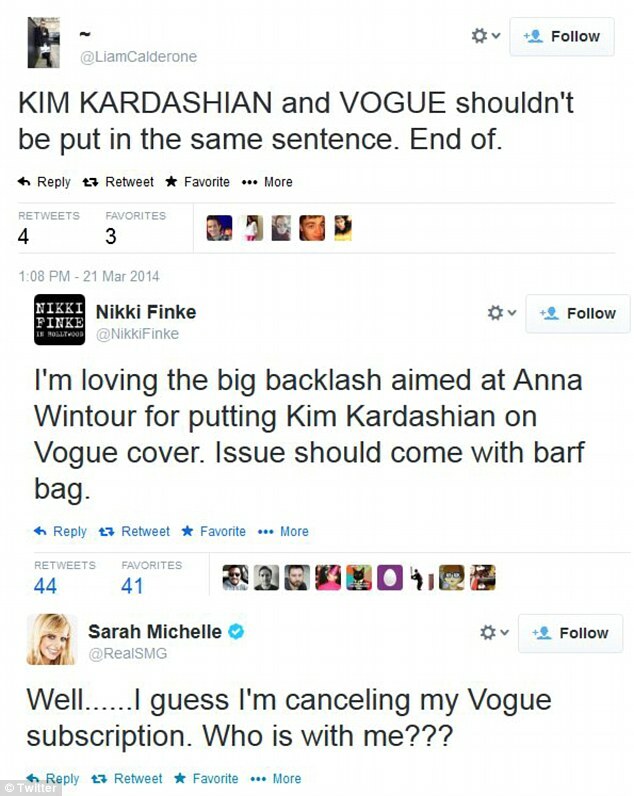 And even celebrities weighed in, with Sarah Michelle Gellar tweeting her disgust. ‘Well……I guess I’m cancelling my Vogue subscription. Who is with me? ?’ she wrote. However, Kim seemed unaffected by her detractors now that she’s achieved one of her goals in life. ‘This is such a dream come true!!! Thank you @VogueMagazine for this cover! O M GGGGGG!!! I can’t even breath!’ (sic) she tweeted.